Having the time out of sync on a machine or server can cause all sorts of problems. I’ve seen computers dropping off the domain, unable to access resource, or users can’t log on to the domain or can’t access secure website because the computer believes the certificate is invalid. This is usually due the Windows Time Service not running or unable to update the time. 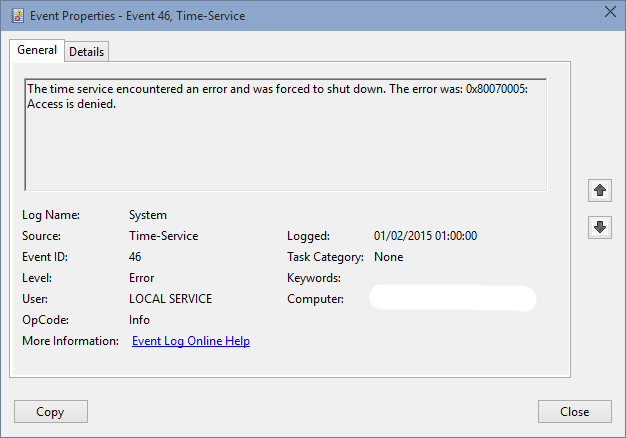 If you ever encountered similar errors or seen Event ID 46 in the Event Viewer here is an easy fix for you. I never really spent much time in trying to find out what’s causing it, but the following has never failed me. To fix the problem you have to un-register and re-register the Windows Time Service. To do that open Command Prompt as the Administrator and paste in the below commands. There are a few occasions when un-registering or registering fails. In that case make sure that the service is not running (net stop w32time) and run the command that fails twice. There are also occasions when you are unable to start the service after registering it and you receive an Event ID 1290. You can overcome this issue by registering the Windows Time Service in it’s own svchost process with the below command. Note the extra space after the type= ! Without the space the command will fail.